Disclaimer: This review is my own personal opinion and I am not affiliated/have not been asked to write this on behalf of KU Leuven in any way. I am an ex-Erasmus student of the institution and an ex-resident of their Waterview Residence. Prior to going on my Erasmus exchange, I applied for KU Leuven halls of residence. I had heard from ex-Erasmus students that their application was declined, so I did not have high hopes for success. The Waterview Residence was listed as one of the halls options, but as it was a little bit out of my price range at the time, I didn't apply for it originally. As expected, my application for halls was rejected. I moved to Leuven in September 2015, without having secured permanent accommodation during my 10 month Erasmus stay in the city. 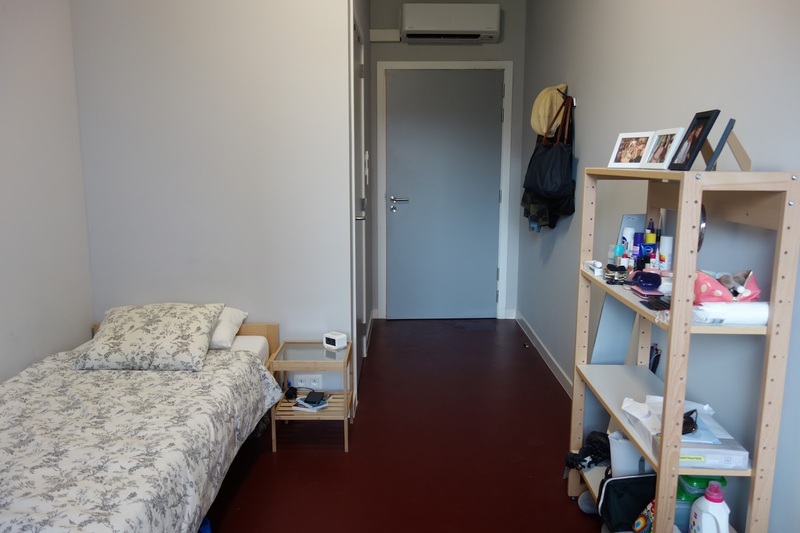 I lived in temporary accommodation for one week and visited the KU Leuven Housing Office to book appointments to view kot's (Dutch term for a room in a student house) and residences. After seeing there were extra rooms available at Waterview, I booked an appointment to view a room in the middle of the week. The manager showed a Belgian student and I around one of the rooms on the Beam part of the residence and I was instantly impressed with the residence and it moved to the top of my desired for residences. The manager asked for me to fill in an application form and my list of preferred rooms. By the following Monday, I had signed the 10 month contract and had moved into my room. 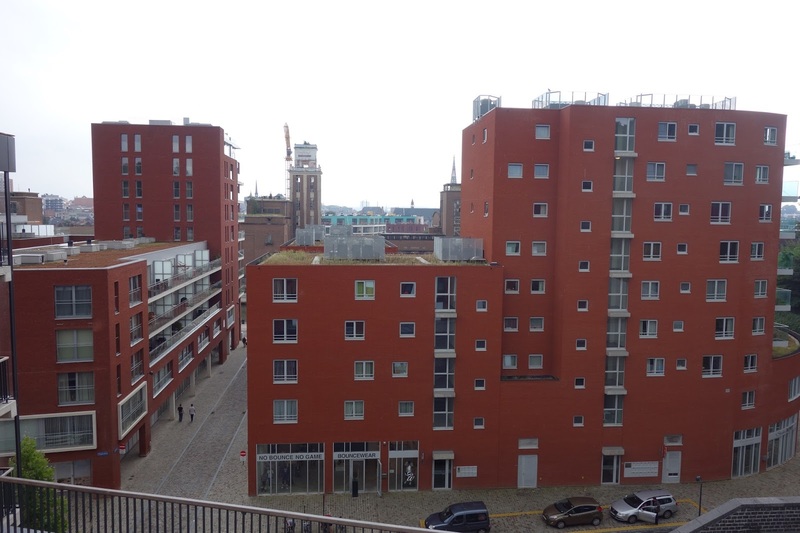 Waterview is located at the very North of Leuven, in a newly constructed area called 'Vaartkom'. 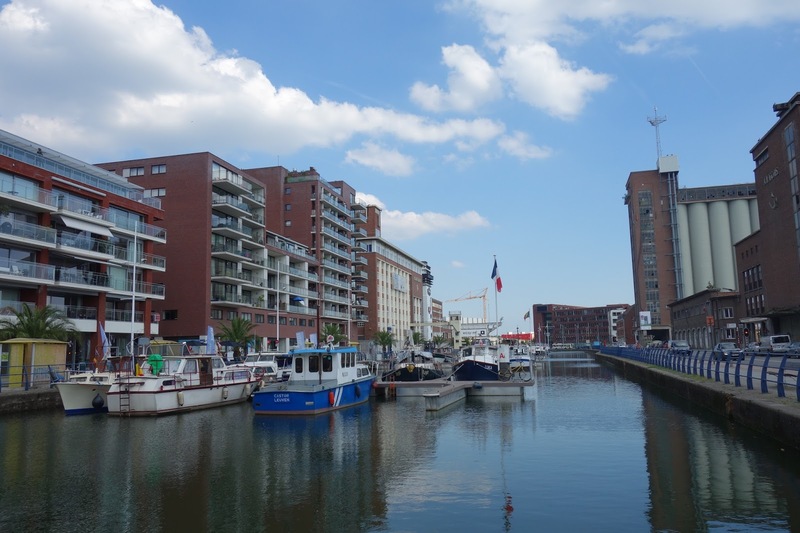 As the name might suggest, there isn't actually a 'water view' from the residence itself, but a short 30 second walk through buildings opposite the residence will lead you to the 'Vaart', a canal. Throughout my stay in Waterview, the area around was constantly improving. As the residence had just newly opened when I moved in, only an Albert Heijn (supermarket) store was available on the ground floor of the residence. When I moved out, the range of shops expanded and a Kruidvat (drugstore) and Easy-M (apple store) opened next to Albert Heijn. There is a Cafe and culture centre, Opek, at the end of the Vaart and an array of restaurants from a Vegan cafe (Noordoever) to De Hoorn, which is located in the old Stella Artois brewery, now converted into a bar/cafe. The Vaartkom area of Leuven is definitely the most modern part of the city and the city of Leuven are always looking of ways to invest more money into the area - with talks of possibly converting part of the Vaart into a beach in a few years! Q: What's the difference between the 'beam' and the 'tower'? A: Looking a the photo above, Albert Heijn, Kruidvat and Easy M are present on the ground floor - in the middle of the Waterview residence. There are three outside elevators to the left of these shops, this is the entrance to the 'Beam'. The first four floors of the Beam consist of studios, but the 5th floor consists of both studio rooms and individual rooms, sharing a kitchen etc. The 5th floor of the beam is situated on the rooftop of the residence and has three gardens dividing the four residential blocks. The gardens are accessible to all Waterview residents. On the right of the businesses on the ground floor is the entrance to the 'Tower'. 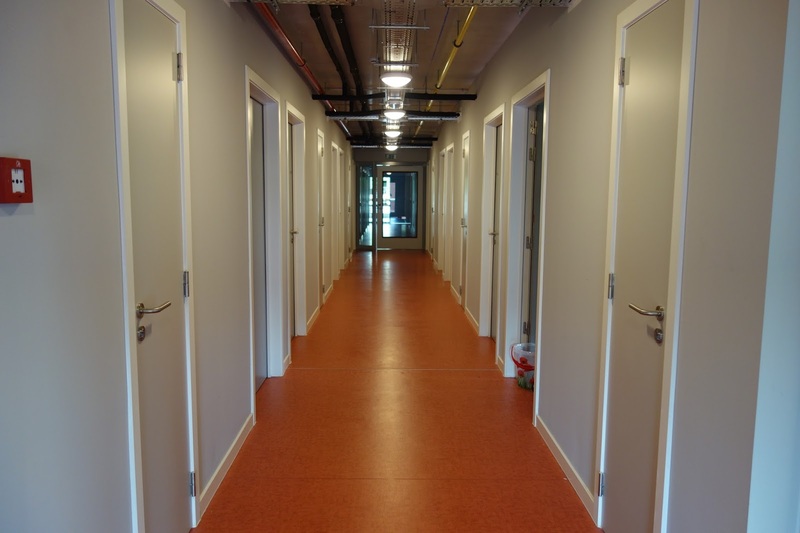 Inside the tower entrance is the Management Office, the Common Room and 12 floors of rooms for residents. 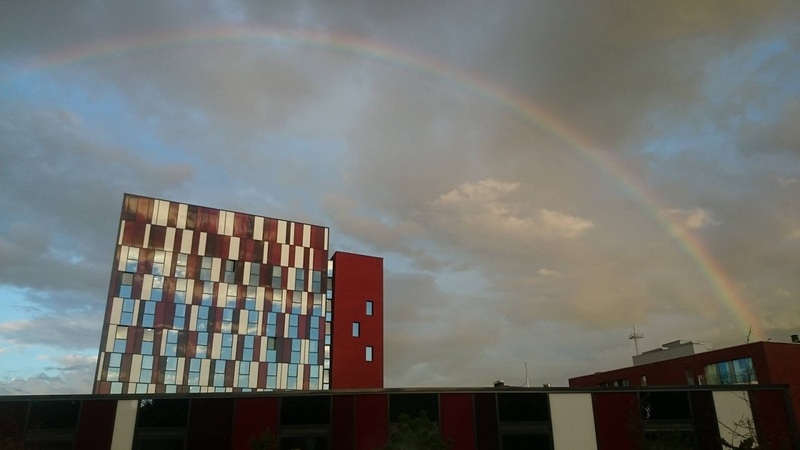 Q: How secure is Waterview? A: Very secure. 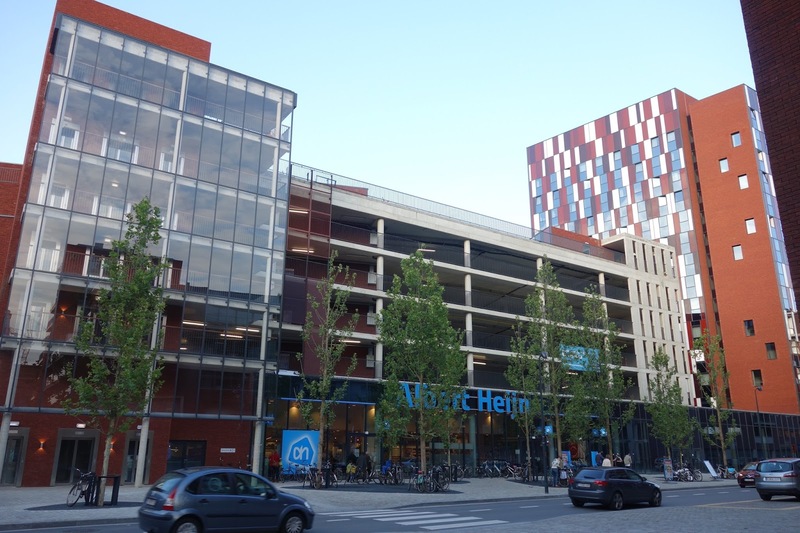 The elevators to the 'Beam' are available for the public to use too, as the first 4 floors are also used as a car park for the Albert Heijn supermarket. 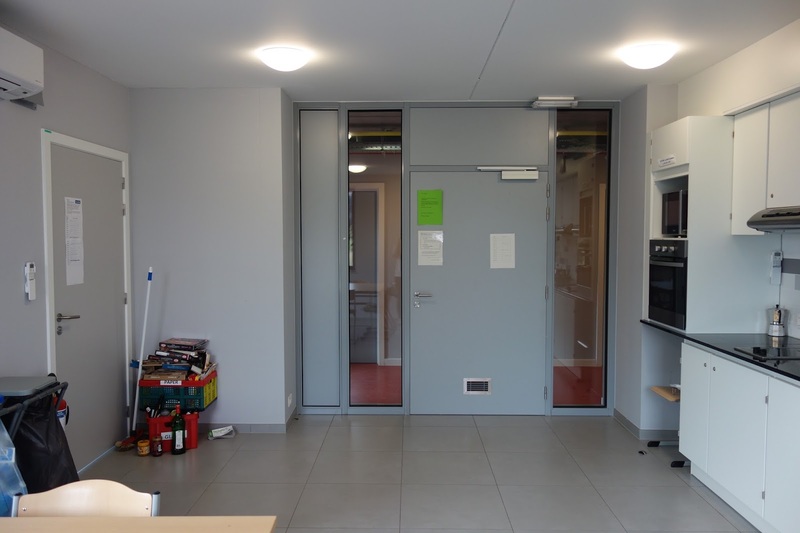 To access the fifth floor of the beam, there is a gate, which requires you to scan your student card, then you must enter your key into the building's front door, and then again to access your room. For all other floors, there is a separate entrance, which requires scanning of your student card to enter. Concerning the tower, your student card must be used to access the building and elevators, your key to access your unit and again to access your room. I stayed on floor 5 of the 'Beam' during my stay at Waterview. 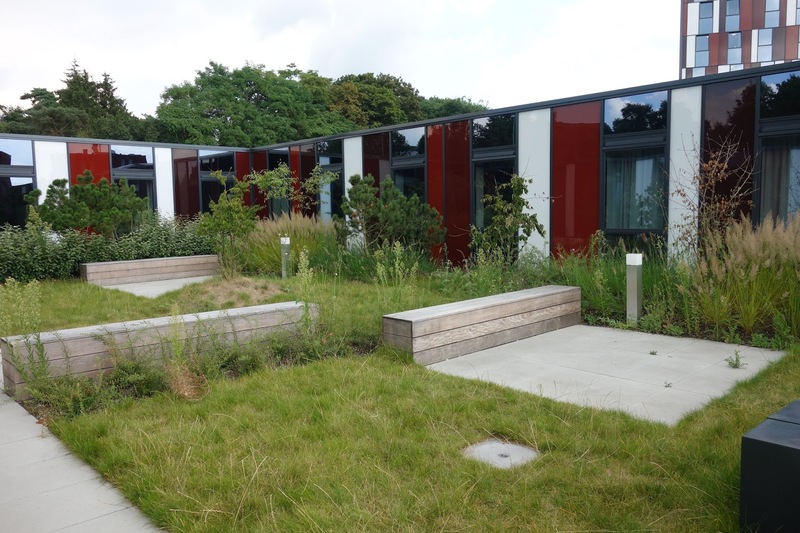 I was instantly attracted to the rooftop gardens and spent a lot of time throughout the year chilling in the garden with friends and even studying there during exam periods. Moving in, I was supplied with a wardrobe, desk, cabinet, bookshelf and a bed with a mattress. My room at home is covered in photos with friends and family, so I brought all of these photos to Belgium and decorated my wardrobe with them. Whilst shopping for a halloween costume in Brussels, I came across a section of a fancy dress store that sold flags from countries all over the world. 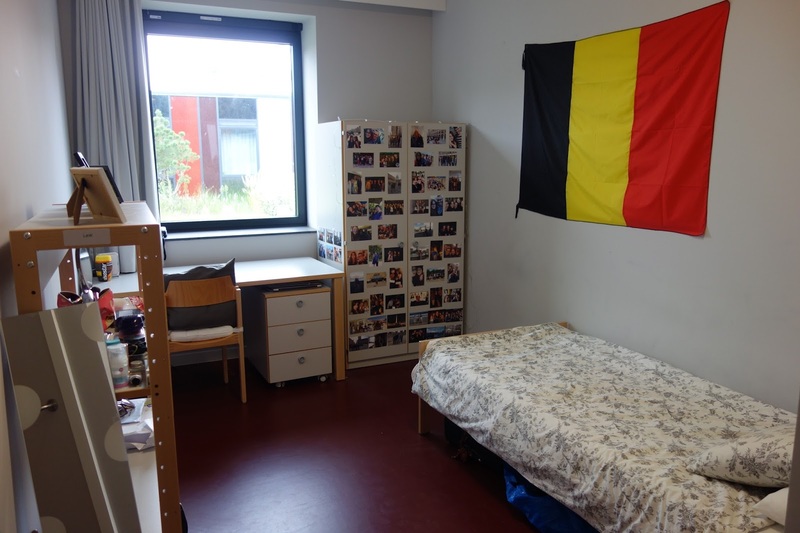 Failing to find a Scottish/Union Jack flag, I settled on a Belgian flag and it was actually quite a nice addition to my room. Q: Is the furniture supplied large enough to store all your belongings? A: Yes. I kept all of my school books in my bookcase and stationary/personal documents in my cabinet underneath my desk. In the wardrobe, the right side consists of a hanging rack and a shelf at the top. There are 4 shelves on the left side of the wardrobe to store folded clothes/underwear/shoes. I found the furniture provided was enough for me to comfortably store all of my clothes and belongings. Wi-Fi is included in your rent, but you are required to buy either an Ethernet cable or Wi-Fi box in order to connect to the Wi-Fi. I bought a Wi-Fi router, which can be found for a small expense at the Fnac store on the street 'Bondgenotenlaan'. I was also supplied with a phone which acted an an intercom service for anyone visiting. It proved useful when friends were visiting, instead of texting, they could simply call my room to let me know they were outside. I bought most of my essentials from the HEMA store on the street 'Diestsestraat', such as a duvet, lamp, cushions and kitchen equipment. A month into my stay, I went to the big IKEA store in Zaventem, which is easily accessible by bus from Leuven train station, where I bought non-essentials such as a bedside table, fairy lights, photo frames and a full length mirror. I visited some friends in the 'Tower' of the residence and noticed two main differences between the rooms there and those in the beam... First, the colour scheme. The floors in the Tower are light blue and the door is red as opposed to the Beam, where I had red floor and a light blue door. The residents in the tower have a radiator in their rooms, whilst in the beam we didn't have a radiator, but instead had an air conditioning unit which expelled either hot or cold air. I never had any problems with temperature in my room that couldn't be rectified by having the air conditioning unit on for a short period of time. In the bathroom, there was a toilet, sink and a walk-in shower with a curtain. I loved the full mirror above the sink. I bought an over the door hook to hang up my towels and the bathroom mat. I was supplied with a toilet brush, but personally I find them a bit unhygienic, so bought my own bathroom cleaning products and stored them next to the toilet instead. There were 12 rooms in my unit. 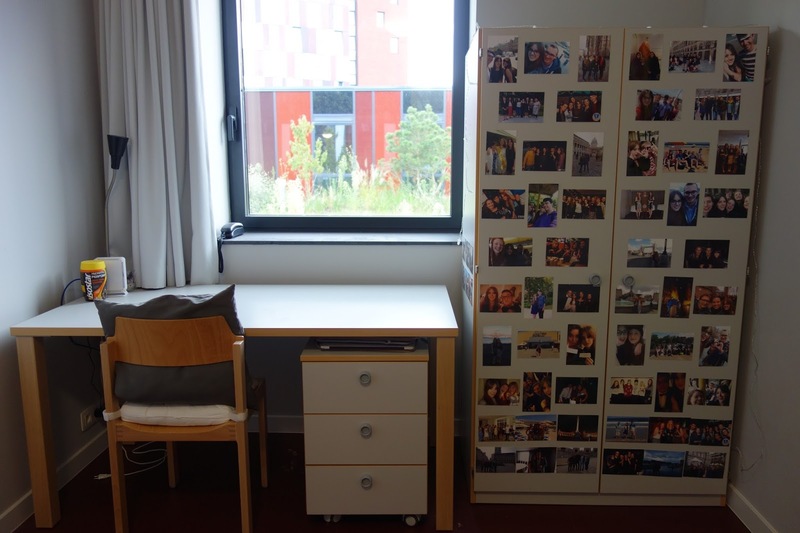 A maximum of 10 rooms were occupied throughout the academic year and this reduced to 6 in the summer months after the residents with 10 month contracts had moved out (NB: I later had to extend to a 12 month contract due to resit exams). Q: Were you ever disturbed by your neighbours? A: My room was next to the kitchen on one side and my neighbour on the other side. I expected it to be noisy having the kitchen next door, but it wasn't as noisy as I expected. During meal times, I could hear pots clanging and voices if they were raised over the sounds of cooking, but it wasn't ever a problem for me. Q: Did you ever have any problems in your room? Are problems resolved quickly? A: The first room I moved into didn't have electricity and had a huge hole in the ceiling. I told the manager as soon as the office opened the next again morning and I was given keys to another room immediately. Halfway through the year, my sink started leaking and this was fixed in the next working day. Waterview supplies residents with a problem-reporting portal log-in, which allows residents to reports any problems they have in their room. Bearing in mind I moved in just when the residence had opened, I found problems were rectified as soon as possible. I shared a kitchen with 10 people in my unit. Due to different cultures and the Belgians going home every weekend, I often cooked alone, or at most with 2 other people. We were supplied with a microwave, oven, three electric hobs, two sinks, three fridge/freezers and garbage bins. Q: Where do you store your food? A: When given room keys, you will also get a key to a cabinet in the kitchen. Typically, there are two shelves to put food/kitchen utensils in, but each cabinet varies in size. You have the option of locking this cabinet every time you are not in the kitchen to keep your belongings safe. We each claimed about 2 shelves in the fridge and a drawer or two in the freezer, so there is plenty of space to store food in the residence. We re-arranged the furniture when we moved into the residence. Originally, it was arranged as one long table, but to encourage more social interaction at meal times, we moved the tables together. 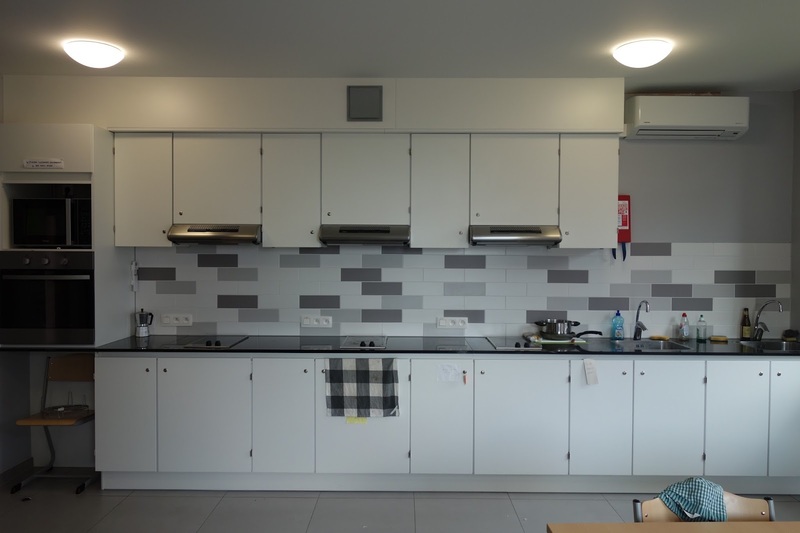 Q: Apart from the kitchen, is the a common area in Waterview? Yes, on the first floor in the tower there is a 'Common Room', which is a room full of sofas, tables, chairs and desks. Since I left, I heard they moved a TV into the room also. There is a fridge/freezer and a Wi-Fi box also. During exam periods, the Common Room is transformed into a Study Room, which is open 24/7 and silent to allow residents to study. I regularly used the common room to study in the evenings once the main University libraries had closed for the day. Recycling is obligatory in Belgium, so we were given a garbage bag for general waste, then another bag for plastic bottles. In addition, one of my neighbours arranged to have extra boxes in the kitchen for glass and cardboard recycling too. We had a garbage rota, so every week it was someone's responsibility to take out the garbage/recycling to the bins that were situated in the basement of the residence. Q: Is there a cleaning schedule? A: The kitchen is cleaned on a weekly basis by the cleaning team. We were asked to make sure there were no dirty dishes lying around on the day cleaning would commence. The cleaners cleaned the worktops, sink, table and swept/mopped the floor. We were responsible for cleaning the oven, microwave and for taking out the garbage. Each resident is responsible for cleaning their own room. Q: Is there a place to do laundry in Waterview? A: Not at the moment. I did my washing in a laundrette called 'De Wastrommel' (address: Sint-Maartenstraat 25), a 15 minute walk from the residence. The laundrette is close to ALDI and LIDL as well as the main shopping streets in Leuven, so I regularly went food/clothes shopping as my clothes were washing. Update: there are now laundry facilities in Waterview! Q: How far is Waterview from the city centre? A: It took me 20 minutes to walk from the residence to my campus (law school, De Valk) on Tiensestraat. I didn't purchase a bike throughout my stay, but most people in the residence owned one. A few of my neighbours studied in the Arenberg campus, which was about a 15-20 minute cycle away. There is a bike garage situated in the basement of the residence. 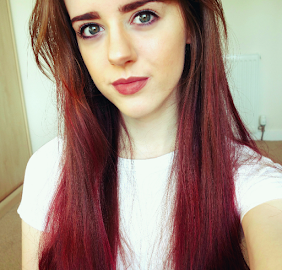 I regularly took advantage of my student bus pass. There is a bus stop on Engels Plein, which takes 15 minutes to Leuven station and continues to follow the ring road around the city. A: I've seen a lot of construction around the area on Google Earth, is it safe at night? The building is also next to the ring road - is it noisy with both factors combined? A: The residence doesn't actually exist on Google Earth at the moment... If you try searching for it, you will find the construction site before the residence was built. Now the area is completely construction-free. I'm not entirely sure what is happening to the old Stella Brewery, but it is likely to be demolished in the future. There are also construction works going on on the street 'Vaartstraat' which leads you to the city centre from Waterview. Belgian construction work seems to take hardly any time at all, but I can assure you Leuven is a safe city and I felt comfortable walking home alone after being in the city centre late at night. Yes, the residence is situated next to the main ring road around Leuven. From the Beam, I didn't hear any cars go by, even from sitting in the garden. I have heard from residents in the Tower that they can hear the traffic, but this is only apparent for rooms that face the road and only when windows are open. Q: How did you enjoy your experience overall at Waterview? 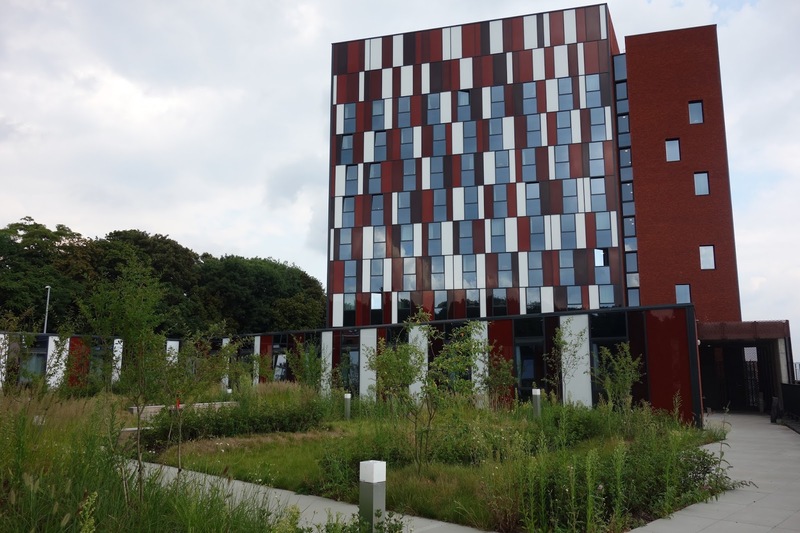 A: I really enjoyed staying at Waterview and would highly recommend the residence to any students/staff at KU Leuven. 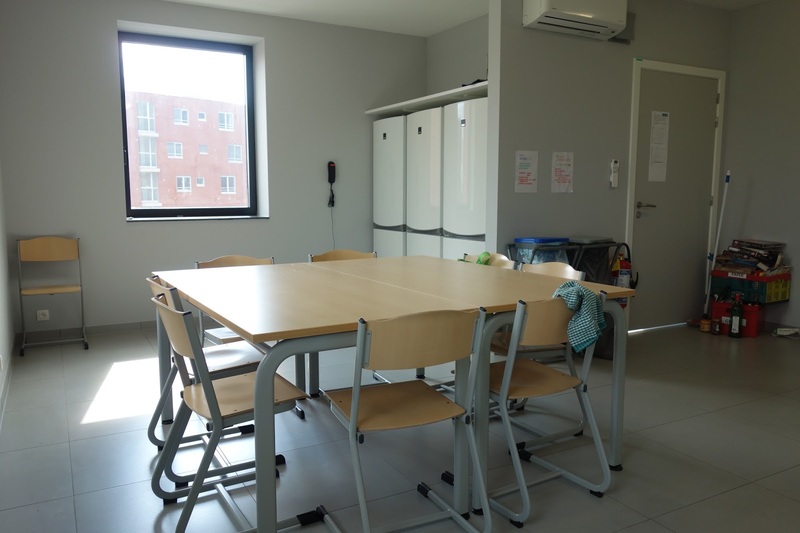 I was a little bit nervous about meeting friends when I first moved in, but my unit consisted of 7 international students who were in the same boat as I was, and 3 Belgian students. It was nice to have a mix of people from the UK, internationals and Belgians in my living environment. 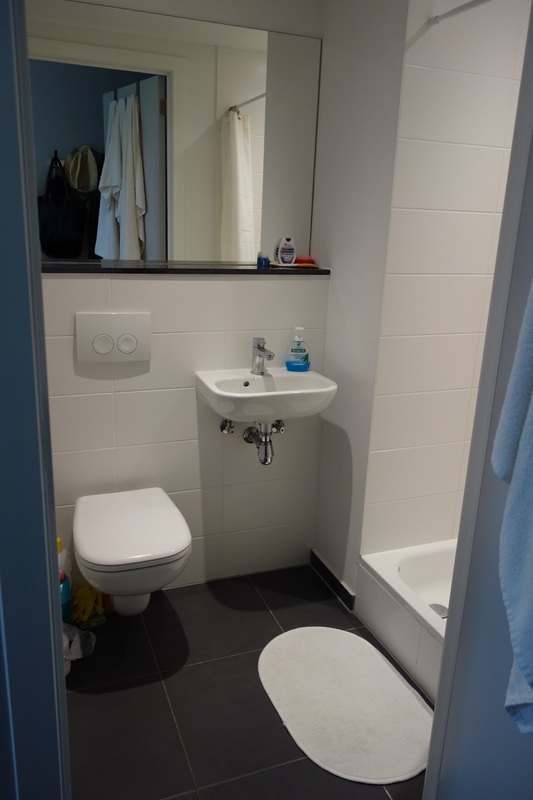 The staff in the residence were always available if there were any problems and circumstances such as extending my rental contract was dealt with quickly and with ease. I actually miss living in Waterview a lot. I met my now-best friends there and memories of sitting in the garden with friends chilling with food and beers will always take me back to the good times I spent in the Waterview residence.